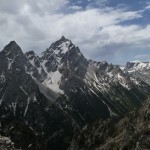 Symmetry Spire is the home of several old classic Teton rock climbs, though they are now less popular than the harder climbs in Death and Garnet canyons. Since the Spire and I have some history, I was eager to go back and tick it off this year. 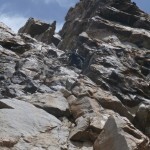 I managed to talk Chance, one of the trad climbers here, to join me on the moderate southwest ridge route. 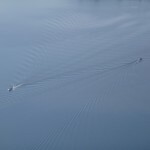 I even convinced him to bike to the boat dock and hike around the lake rather than driving and paying $10 for the ferry. 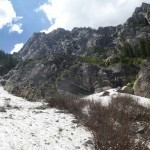 As I have done every time, we cruised around the lake, turned up-canyon too soon, and had to shortcut up to the horse trail to reach the Symmetry Couloir climbers’ trail. 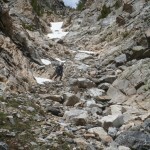 We followed this through the dense brush to the edge of the snow, then laboriously kicked steps up the main couloir. Near my high-point last year, we managed to scramble up the right side to a bench above the cliff band, soon rejoining the very obvious trail. 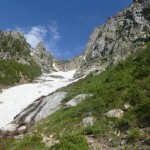 From here to the base of the route, the trail dodged in and out of the snow up the steep gully, a long grind when carrying rope and rack. The southwest ridge is obvious from the approach, and climbers have created a well-packed dirt platform at its base. (There is also plenty of fixed gear along the way, though it’s hard to get lost.) 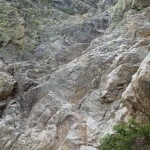 Chance led the first pitch of mostly-easy climbing to a belay below some steeper terrain. I led the second, which had a couple of interesting steep sections, but also a fair amount of walking. 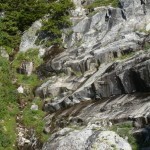 I chose to belay in a flat area below a steep, right-facing dihedral. Chase led this third pitch, finding some delicate climbing at first, then pulling over onto easier but still interesting ground above. Following, I found a decent crack in the dihedral, but not many features on the faces, forcing me to crack climb for a few moves. 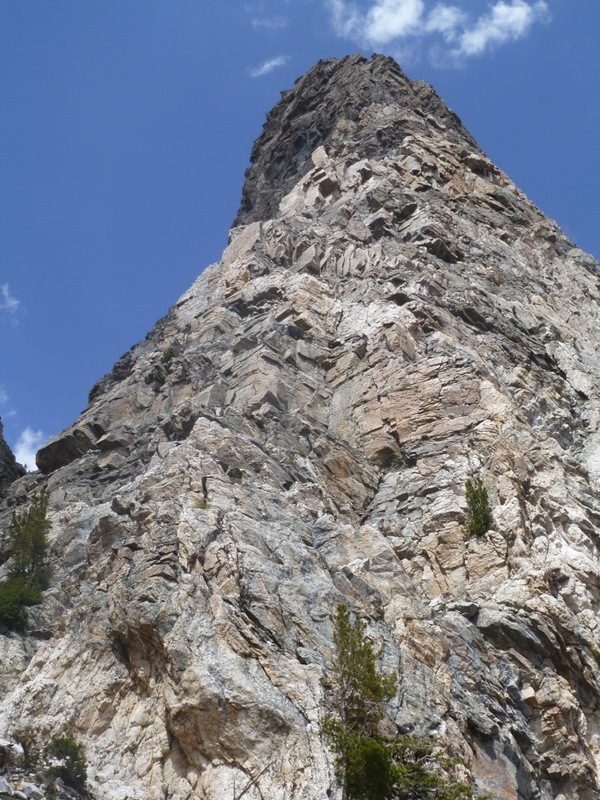 The start of the 4th pitch is the “nose” feature, a steep, rounded golden block with two fixed pins, rated 5.7. I clipped both, and after dithering a bit, worked my way up on some small feet and nubs until I could grab larger, rounded edges above and pull myself up. Moderate climbing got me to a ledge, where I eventually found another pin to the right around a corner. 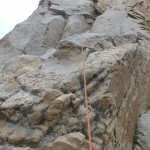 Even though I had run it out on the easier ground, rope drag started to became an issue. After more moderate climbing in a slot, I placed a dubious #3 cam, then pulled around right and over a bulge to a comfortable belay. A minor squall blew through as Chance led the 5th pitch, which starts by circling slightly down and left to a right-trending ramp. I struggled into my jacket one-handed as he made his way up steeper blocks, then a short chimney next to an obvious flake at the top of the climb. 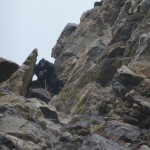 As soon I was on belay, I sped up the pitch at “get me out of here” speed, not wanting to be caught by the rain and forced to climb wearing my garbage bag. As it turned out, no serious rain came our way, and the top was pleasant and sunny. 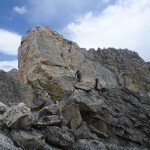 We packed away most of our gear, then scrambled 4th class terrain along the summit ridge. I found the rappel anchor, a decent pile of aged tat, and sped on to the summit; Chance, his inner cragger showing, stopped at the rappel. Slightly mystified, I returned to have a “summit” lunch down below before rapping into the Symmetry Couloir. 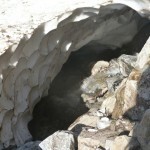 The couloir gave Chance a few parting slaps, but we made it back to the Ranch more-or-less unscathed in about 10h30. While I would have been comfortable soloing most of the route, I was glad for the rope in a couple of places, and also glad to get more practice at climbing with gear. We climbed with a single set of stoppers, cams up to #3, and a few tricams, all of which were useful. Rope drag can be a real problem, and several of the belays have large blocks to sling, so bring several double-length slings. 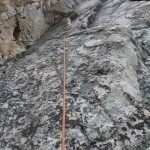 Many of the belays are out of sight of the follower, so communication can be difficult in the wind. 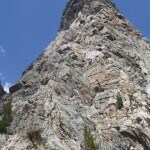 This entry was posted in Climbing, Wyoming. Bookmark the permalink.